Painter, Albert J. F 34 dark 5' 9" black black farmer New Castle, Pa. Oct 7, 1891 Des Moines IA not found Per ACWRD, POW 3-25-1865 at Fort Stedman, Petersburg, VA.; deserted (date not stated) and returned (date not stated). 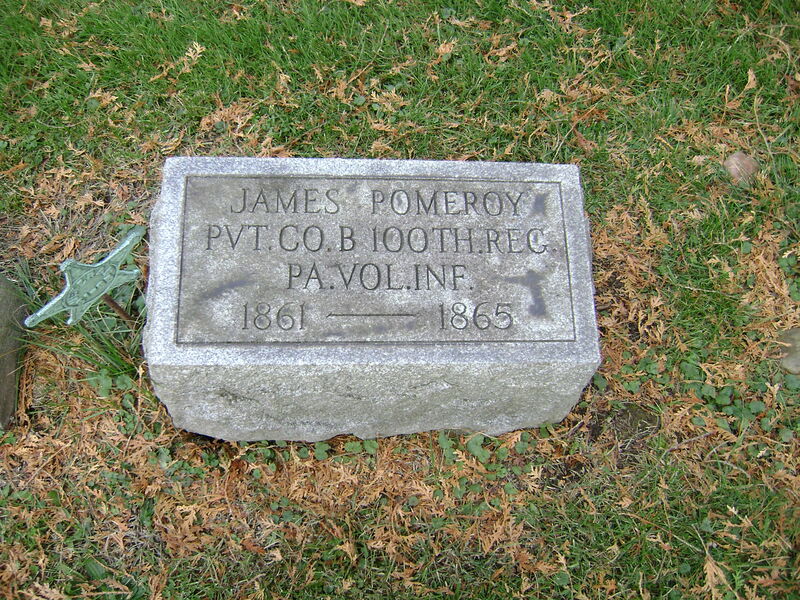 Palmer, James B 25 Coitsville OH Leesburg, Mercer Co, PA Nov 19, 1839 1-Mar-1912 Not found Birth and death dates per ACWRD. 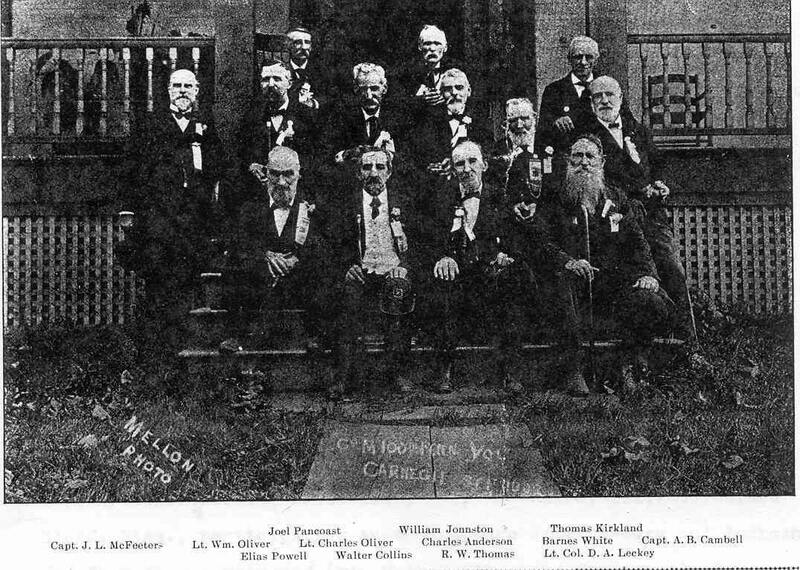 On 8/31/1861 he mustered into "B" Co.; Mustered out with company July 24/65, wounded at Spottsylvania CH, May 12, 1864; after the war lived in Youngstown, OH., middle initial "S". Parker, James A. E 21 carpenter Trumbull Co OH Dec 16, 1839 June 16, 1862 James Island SC Not found killed per Oct. 15, 1884 reunion photo. Per ACWRD,On 8/31/1861 he mustered into "E" Co; birth date and lived with Andrew Christy at Plaingrove. Parr, James D 24 not found Per ACWRD, 1865 substitute discharged 7-16-1865 for wounds rec. March 25, 1865 at Fort Stedman, VA; severe wound in right leg, amputated. Patterson, James S. F 24 farmer Eastbrook, Pa. June 16, 1862 James Island SC not found Per ACWRD, On 8/31/1861 he mustered into "F" Co. killed at James Island, SC June 16, 1862 (Secessionville). Patterson, Jimsey S. C 28 shoemaker Worth Twp, Butler Co. PA March 3, 1841 31-Aug-1903 X 61917013 Middle name "Stewart"; Per ACWRD, On 8/31/1861 he mustered into "C" Co.; He was discharged on 3/19/1863; wounded 6-16-1862 at James Island, SC; wounded 8-30-1862 at Bull Run, VA and injured 9-17-1862. Patterson, Joseph F 19 light 5' 4" dark brown farmer Hickory Twp., Pa. Lawrence Co.; Hickory Twp. PA Lawrence Co. PA March 15, 1845 25-Feb-1922 New Castle (Volant) PA not found Per ACWRD, On 2/20/1864 he mustered into "F" Co.; He was discharged for disability on 9/15/1864; birth info. Patterson, Smith C 29 nail cutter Hillsville, PA June 2, 1864 Cold Harbor VA not found Per ACWRD, birth location and death date/location. Pence, William R. C 20 dark 5' 6 1/2" brown brown farmer Lawrence Co. PA Sept 13, 1842 11-Oct-1922 Brady TX X 58896258 Per ACWRD, birth location and also lived in Biddy City, TX after war. Perrine, James G 19 Sandy Lake, Mercer Co., PA April 25, 1842 July 30, 1864 Petersburg VA 33921057 On 2/20/1864 he mustered into "G" Co.
Phillips, Ely B. C 19 farmer Brady Twp, Butler Co. PA Feb 14, 1844 17-Jun-1923 Cowansville PA not found Wounded 12-7-1861 (place not stated). Potter, Samuel A 26 April 1868 Washington PA Not found No other information found. Powell, Elias M 39 Allegeheny Co., Elizabeth 17-Apr-1916 Pittsburgh PA X 77812130 X shot on right hip. Powell, Thomas J. D 23 carpenter Oct 7, 1862 Mil Asylum Cem DC X 34746118 Wounded at Chantilly 9-1-1862. Pry, Jacob C. A 22 Washington Co., pA July 13, 1839 30-Jul-1916 Santa Barbara CA Not found Per ACWRD: middle name "Conrad"; wounded at South Mountain 9-14-1862; birth information and lived in Montecito, CA after war. Pyle, Morgan A 38 Erie, Soldiers and Sailors Home PA 18-Sep-1908 Dayton (Nat. Cem) OH 1097972 pension card death date and location matches findagrave info.